Swimming is a good choice for weight loss. 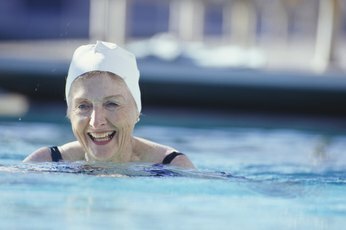 The pool is a great place to exercise for weight loss: it doesn't put pressure on your joints and it keeps you cool and comfortable while you exercise. Keep in mind that just jumping in the pool and playing around in the water won't burn a lot of calories, so you'll need to put some effort into the workout if your goal is to lose weight. How much effort depends on your weight-loss goals. To lose 1 pound, you need to burn 3,500 calories more than you eat. Swimming is a great calorie burner, especially if you pick up the pace or choose a stroke that engages more muscles, thus making your workout more demanding. 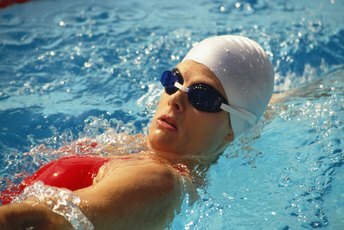 The butterfly stroke is the best for calorie burning, according to Nutristrategy. A 155-pound person will burn 774 calories when swimming butterfly for an hour. Breakstroke is the next best thing, burning 704 calories per hour. If you can manage to swim laps freestyle for an hour while maintaining a fast speed, you'll burn over 700 calories as well, but if you're just leisurely swimming those laps, the calorie burn goes down to less than 500 calories per hour. If you've never considered sports like water polo, this might be a good time to start The sport burns an impressive 704 calories per hour. Other sports, like water volleyball, burn a lot fewer calories -- 211 per hour -- but might still be an option if you plan on jumping in the pool every day but don't have the energy for high-intensity workouts daily. If you prefer something more relaxed than a team sport, water aerobics or water jogging might be more your style. The average calorie burn for water aerobics is just 281 calories per one-hour session, but you can increase the amount burned by wearing aquatic ankle weights or joining an advanced class, which is more likely to increase the intensity of the workout. While just floating around in the pool is not going to burn a lot of calories, treading calories could be a good calorie burner -- over 700 calories per hour -- as long as you're willing to do it at a vigorous pace. Or mix some calisthenics with a bit of swimming and some treading to keep your muscles guessing and your body burning. 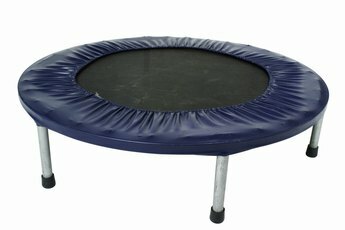 Keep in mind that this won't burn as many calories as swimming laps at fast speed, but it can still be great exercise. Is Swim Training a Good Cardio Workout? Can You Do the Breaststroke Without Putting Your Head Under? Do Swimmers Swim Faster in Cold or Warm Water? Do You Wear a Flotation Device When Deep-Water Jogging With Ankle Weights?